Moran signed on as the artist for an 1871 U.S. Geological Survey expedition and sketched like crazy, capturing scenic views such as the Gardner River, Mammoth Hot Springs, the Upper and Lower Geyser Basins, and, of course, the Grand Canyon. 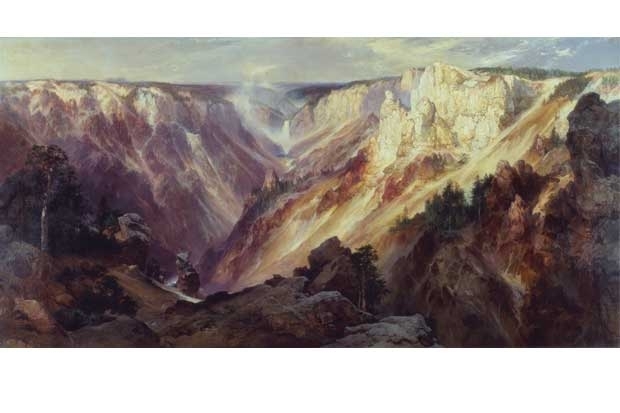 Ten months after he left Yellowstone (and three months after the wilderness was made a national park), Moran painted his first Grand Canyon of the Yellowstone—a work even larger than the one here in Honolulu. It belongs to the Department of the Interior and is on view at the Smithsonian American Art Museum. It wasn’t until 33 years after his initial visit to Yellowstone that Moran created the painting now on view here. “Moran would sketch on site, then do studies and final paintings in his studio,” says Papanikolas. It’s clear that his Yellowstone experience had an influence on his art for the rest of his life.